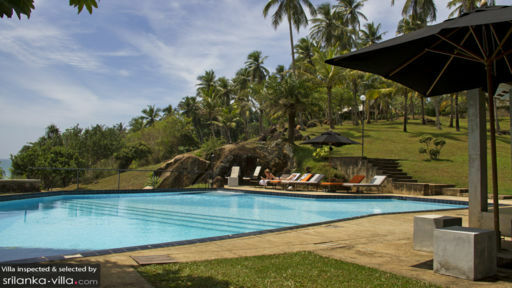 Perched on a hilltop in Tangalle, Sri Lanka, Claughton House is a beachfront property with five bedrooms designed with a Colonial, European flair featuring a white façade, columns, black trimmings, and large open spaces. The private villa offers a space for relaxation and enjoyment with friends and family, where everyone can gather around for a fun time. The best part of the villa is that it provides direct access to the white sand beach out front along with stunning ocean views! The master bedroom is the most spacious of all the five rooms with an abstract layout keeping with the theme of the villa. The king-sized bed sits snugly in the centre overlooking the ocean from the floor-to-ceiling doorways. The white interiors speak to the colonial aesthetics of the villa and the air-conditioned bedroom will soon feel like a home away from home. The en-suite bathroom is fitted with a natural stone bathtub for tranquil baths. The four guest bedrooms are furnished with either single beds or a double bed, sporting a similar whitewashed design and open doorways to allow for the fresh breeze and lighting to flood the rooms. The rooms are air-conditioned and have en-suite bathrooms as well. 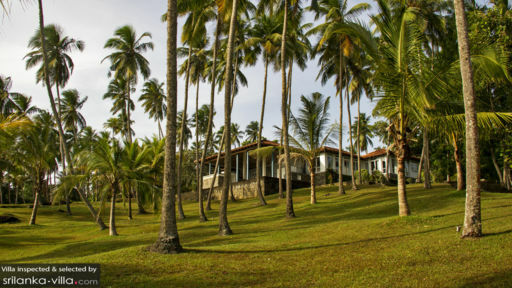 The lush green gardens at the house are complemented by the hilly surroundings as well as the dazzling ocean. The freeform swimming pool along with the abstract design on the floor is as if part of the hill itself as an edge is submerged in it. The gorgeous panorama can be viewed and enjoyed from the sun chairs beside the pool or the gazebo which has been furnished with a daybed for relaxation and comfort. Lounge or sleep as you wish with the sun streaming around you and the trees swaying in the wind for a wonderful and light-hearted experience. An alfresco dining area is found under another gazebo beside the pool for enjoying fresh, hot meals in the open air. Claughton House celebrated outdoor living with an open-plan living area at the entrance of the villa pavilions. The beautiful space is surrounded by gardens and a splendid view of the ocean in the distance. There are wicker chairs and a plush grey couch to make for comfortable sitting for everyone. Long evenings at the villa are a sure way to spend some memorable moments with friends and family as you watch the sunset and the interplay of colours in the evening sky. There are several dining options at Claughton House and all of them are either partially or fully outdoors so you can make the most of your gorgeous surroundings. There is an alfresco dining area beside the pool, a smaller breakfast area out on the gardens, and another dining area upstairs with lavish and sprawling vistas of the region. The kitchen is a modern space with state-of-the-art amenities and facilities for guests. You can either choose to cook themselves or request the chef to prepare your meals! The friendly staff at Claughton House is helpful and will assist you in settling in with ease. The chef can prepare delicious meals for you, if required, for an extra cost, and the staff can recommend local restaurants and places to visit as well! The villa is situated beachside, so you have the luxury of a private stretch of white sand and the ocean all to yourself! Enjoy basking in the sun, or dipping your toes in the cool water of the ocean for a tropical experience. Explore the town on foot or bike and you might come across the cosy café you’ve been searching for all your life! Stayed at claughton house in may first week with friends and family.we had the time of our lives there and enjoyed the hospitality and food immensely.The view of the sea from the property is mind blowing.The staff of the property was very helpful and gave us excellent service.The food,especially the breakfast was delicious.The swimming pool was well maintained and we enjoyed there thoroughly. We spent three nights here from 2nd March 2015 to 5th March. The location and design, layout, decor, upkeep are all outstanding. 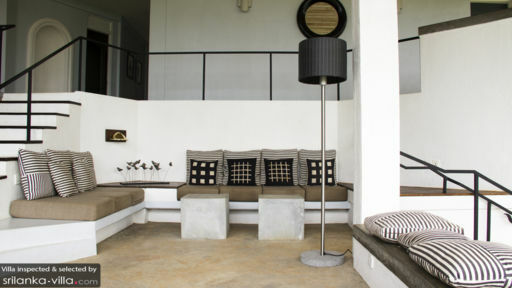 We have long been fans of Geoffrey Bawa after staying at the Villa Mohotti in Bentota and each room in Claughton is built in a way that natural ventilation is enough to keep you comfortable. The food and service are also great, we were particularly touched by the flexibility shown by the management. We occupied four of the five rooms and each one was equally comfortable, will be going back soon! We would highly recommend this rental to anyone looking for peace and quiet. The refurbished villa (Nov 2014) is spectacular. The staff are attentive albeit maybe a bit Colonial in their style and the setting is paradise. The food prepared by the chef was excellent. On the negative side, the car hired for us for a trip to Yala from the Chefs friend had mechanical problems and we were not sure if it would complete the entire journey! The pool is a good size and the beach at the bottom of the garden is great for body surfing and swimming. The villa is on a hill so the villa would not suited for anyone with mobility problems. A definite recommend. We recently (April 2014) stayed at Claughton House and were treated to an amazing stay at this beautiful property - we only wished we could have stayed longer. We were greeted on arrival by Ajith (who serves as the chef and front of house) and his very attentive staff after a long drive in sweltering conditions. Within minutes of walking through the door we each had cold coconut juices in our hands and our bags tucked away in our rooms, leaving us to admire the amazing views from the front balcony of the house. We we're a bit nervous about the state of the rooms at Claughton as several of the reviews we had read on Tripadvisor suggested the property was getting a bit tired, but upon arrival we were greeted by newly refurbished rooms and outdoor areas - the refurbishment has been done really well and is sympathetic to this Bawa designed villa. The grounds of the house are huge and very private, with a palm dotted lawn running down to a swimming pool and pool house (where drinks and/or dinner can be taken) perched on a low cliff overlooking a long expanse of sandy beach with a fishing harbour in the far distance - pretty breathtaking stuff and a great backdrop for meals, drinks, etc. The property runs down to the beach if you ever get tired of swimming in the pool, and on several mornings we saw a number of learner surfers from a local surf camp out on the waves below us. Ajith gave us recommendations for our dinner each night (and was open to our suggestions for variations to his proposed menu), and never failed to impress with what arrived on the dinner table each meal time - he has spent many years working as a chef in the Middle East and his experience shows. His food was a highlight of our stay and I can only assume he has started working at Claughton since the poor reviews below (I have heard the villa has changed hands fairly recently, with this possibly being the catalyst for the refurbishment and new kitchen staff?). Our friends and ourselves were travelling with 2 young children it was always easy to arrange something suitable for them to eat at an early hour which was handy. Ajith buys all of the groceries you need for your stay, and the cost for food for our stay worked out as USD$33/day for two adults and one 2.5 year old for breakfast, lunch and dinner - about $12 each adult. Will hopefully be back to Claughton in the not too distant future. Claughton house is another master piece of Geoffrey Bawa, that situated in Dikwella towards most southern part of Sri Lanka. We were given the master room and it was very comfortable. The room additionally offers a private small garden which you could have a cooling shower. Room amenities look bit ware-out but still comfortable. The huge garden was well maintained and the pool also clean. Since the house could accommodate few few number of guests, some times you may be lucky to have the pool and garden to your self only. The food is tasty but can be good with few more dishes. But they were kind enough to prepare a special mead for our kid. From the location you could see the very scenic Dikwella bay and very close proximity to the world famous Hummane "blow hole". The stay is worth the money you spent.